"This is a simple yet wonderful dish that's full of flavor. The meat is very moist and falls off the bone. We love to serve this dish in our home with rice and fresh corn on the cob." Place chicken in a shallow baking dish and sprinkle with garlic powder. Cover and bake 1 hour at 350 degrees F (175 degrees C). Remove baking dish from oven and drain any fat from dish. 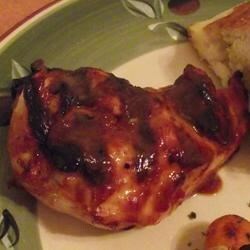 Pour the barbecue sauce evenly over the chicken and bake uncovered for 30 minutes at 350 degrees F (175 degrees C). Remove and serve.